Lee Cribbs Umina Beach team of John Hall, George Bon and Ken Harrison were never headed in a well disciplined team victory 21-14 over The Entrances Jack Burns, Arthur Austin and Tony Bridge skipped by Graham Horton in the “Presidents Reserve Fours” played at The Entrance B C. Trailing 6-16, the Entrance team rallied to pick up four ends in a row to get within reach at 16-13 but Umina kicked away over the closing ends to seal the title. The President Reserves for Grade 5 pennant players and below continues to grow in stature year by year. 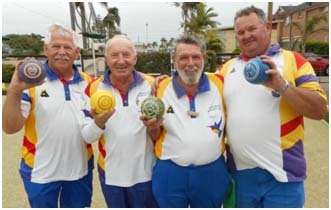 It has become a State Event and the winners will now contest the Bowls NSW State Finals at Ettalong BC from 19th -29th September along with the winners of the Open and Senior events.